Home is thrilled to be exhibiting work by Zilverster in our ‘Melbourne Comes to Sydney’ show during Art Month. Zilverster (Goodwin & Hanenbergh) is an ongoing collaborative project between Sharon Goodwin and Irene Hanenbergh, Melbourne-based artists who have garnered strong individual reputations for their imaginative, elaborate and meticulously rendered expanded drawing and painting practices. What began in 2010 as a problem-solving exercise – with one artist offering problematic, unfinished works to the other for advice on resolution – has evolved into a rich shared practice that continues to extend the discursive as well as process potentialities of each artist. While there are many shared interests and concerns between the two artists – (art) history, fantasy, cult iconography, alchemy, supernatural phenomena to name a few – each operates from a distinct temporal and imaginative framework: Goodwin’s contributions are embedded in a medieval, Gothic context while Hanenbergh’s derive from a European Romantic sensibility. Zilverster’s practice continues to develop out from an original series of beautiful, fantastical drawings that remain compelling in their strangeness. Pictured is an installation shot (detail) of their exhibition Patrino-patrino staged at Sarah Scout Presents in 2018. 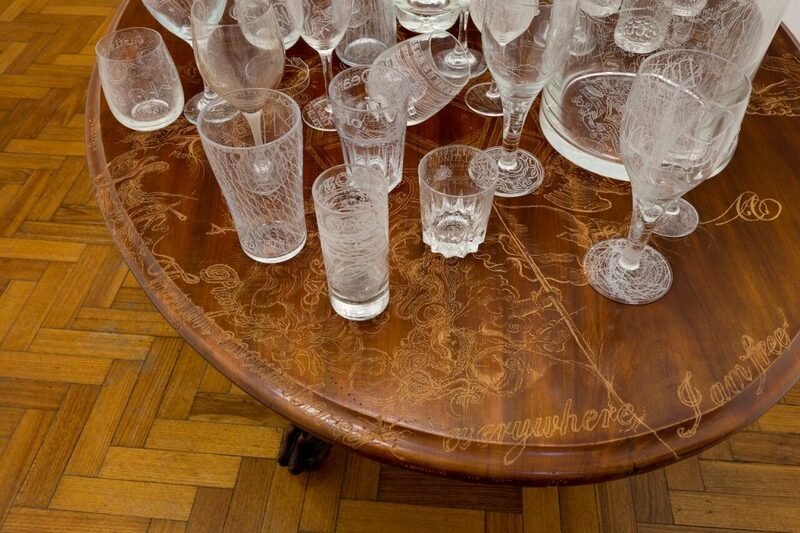 The exhibition comprised a suite of twenty-one new intricate drawings, a number with carved and engraved custom frames and glass, together with a series of glass objects and furniture. The starting point for the exhibition is The Table of Moresnet, an iconic work Zilverster created in 2016, and which first extended the duo’s collaborative drawing practice into the spatial/sculptural realm. The Table of Moresnet is named for a small slice of European history – and failed utopia – the land of Neutral Moresnet. Until WWI, the tiny country existed, tucked away in the hills between The Netherlands, Belgium, and Germany. The small neutral country had been under threat among major European powers until a group of residents came up with an ambitious counteroffensive: they formed Neutral Moresnet into the first Esperanto state and named it Amikejo (‘city of friendship’). A self-declared neutral state, Moresnet/Amikejo was a place where refugees were welcomed and where conscription was abolished. It also had exceptionally low taxes. However, on June 28, 1919, the Treaty of Versailles settled the dispute that had created the neutral territory a century earlier by awarding Neutral Moresnet, along with Prussian Moresnet and the German municipalities of Eupen and Malmedy, to Belgium, thus permanently ending its status. Today, a small museum (Göhltal Museum) is all that is left of this unique episode in European history, as well as 50 of the 60 border markers that mark the former borders. The Table of Moresnet serves as a memorial for this utopian idea, as well as a diary of its own making. In addition to particular historical moments and excerpts of Esperanto text, the table comprises snippets of conversation between the artists, a record of visitors to the studio and numerous pop-cultural references. As a functional object, it both highlights and repurposes its own historical context and as a conceptual art work, it brings the past and present into focus, as well as playfully disturbing the traditional distinctions between high and low art forms. Zilverster appears courtesy of Sarah Scout Presents, Melbourne. Zilverster, The Table of Moresnet (detail), 2016.